Crafts for Kids by Gill Dickenson. A Craft Library Book. Review: One adorable creation one after another little kids laughing and playing with their new piece of art. Crafts for Kids by Gill Dickinson is an adorable read. It shows great crafts for the young soul to enhance their creative mind and be able to express them selves in their art. Crafts for Kids shows a variety of different crafts and some variations so you don't run out of ideas quickly. Also, it gives ideas for every season, each idea better than the last one. This book makes it simple to complete each craft by showing step-by-step instructions and it shows pictures to help explain for the visual learner. Some crafts you learn to make are fake flowers, straw people and many more. 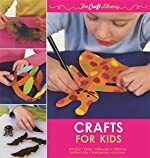 Crafts for Kids is a book that I would recommend for any mother, daycare, or art teacher. It teaches kids how to express themselves through what they make. This book could be for any gender, and would be the most fun for kids' ages from 2 to 6 years old and their parents. So have fun, be creative, and be an artist! Review written by Karissa (6th grade student). We would like to thank Media Masters Publicity for providing a copy of Crafts for Kids for this review. Have you read Crafts for Kids? How would you rate it? That's really cool. My daughters would like to do something like this. They love arts and crafts. They are always making me something, usually out of ribbon which they love. I never knew ribbon could be used in so many different crafts. Thanks for posting.